There are more slaves today, well over 40 million, than at any time in human history. 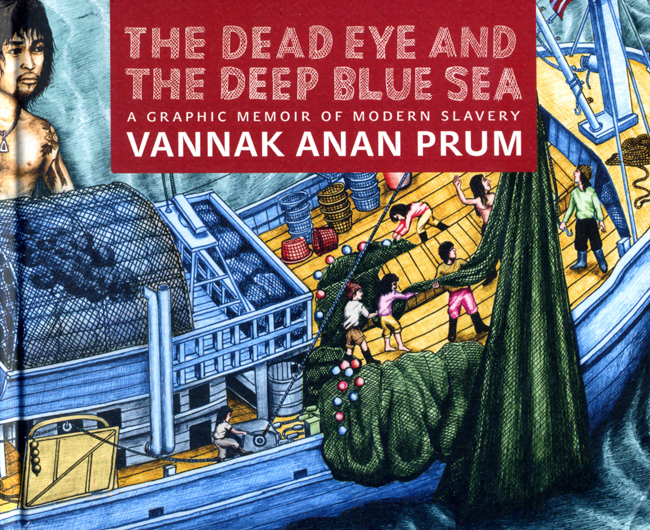 A new book, a graphic memoir, by Vannak Anan Prum provides a most vivid and compelling testimony, through luscious watercolors and the author’s honest oral account, transcribed and composed to meld with Prum’s artwork. 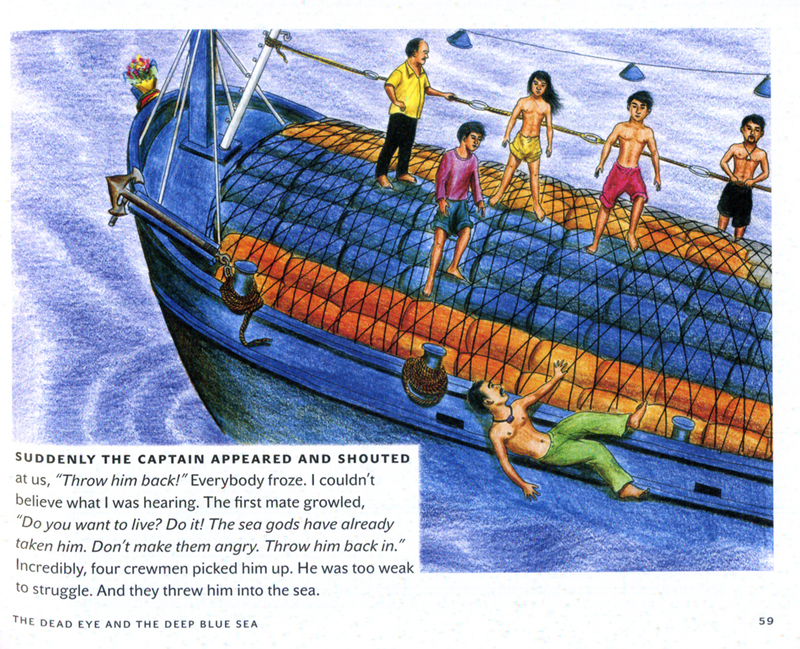 The Dead Eye and the Deep Blue Sea is a 256-page hardcover, in full color, published by Seven Stories Press. First and foremost, this is a unique and remarkable book that readers will quickly find themselves immersed in. Human trafficking is not an obvious subject matter for the casual reader but Mr. Prum handles the subject with great dignity, never delivering a false note, and even maintaining a sense of hope throughout. 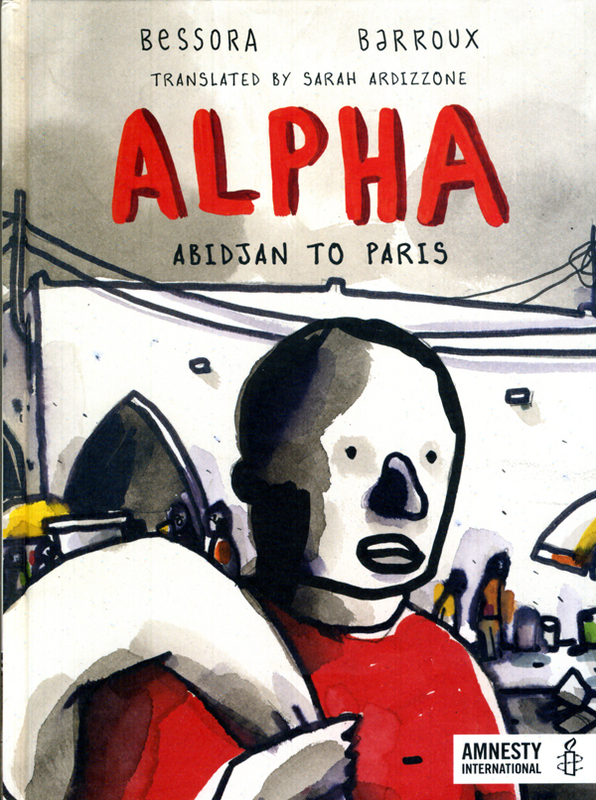 This is not a conventional graphic novel/memoir. But, in the process of reading it, I found myself open to seeing this book as functioning as comics–even if it forgoes many of the building blocks of the comics medium. 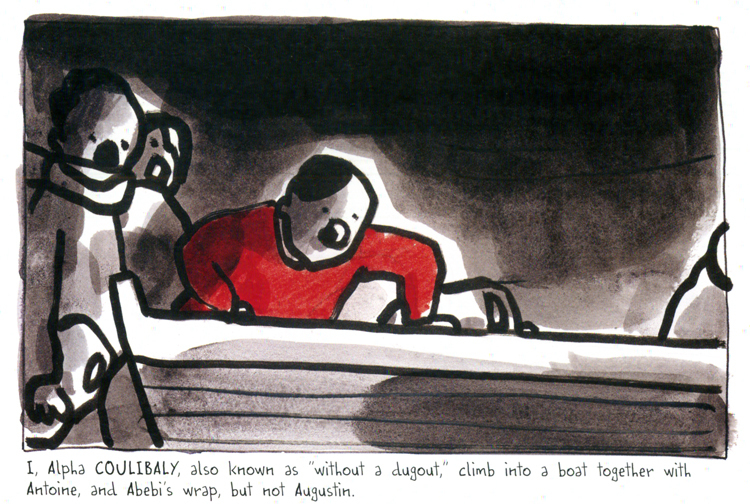 Was Prum ever really intending to create a work in comics, per se? I think Prum is working on a pure level, one that takes the tools required to get a job done. So, given his background and his harrowing experience, I’m sure that he wasn’t mulling over whether he might end up creating a book that would be deemed one of the hippest graphic novels of the year by the A.V. Club, The Comics Journal, etc. No, this man was in dire straits, as serious as a heart attack, and he was most interested in documenting his experience. Surely, he was thinking of working as an artist in some general sense but, even more so, Prum required his work to align with the accuracy of a top notch courtroom sketch artist. Get the facts out, first. Then take care of the artistry and poetry. Death on a slave owner’s whim. Even after the experience and with time for contemplation, Prum is driven to document, much in the artist tradition of, say, Albert Bierstadt, Winslow Homer, or Charles Fritz. 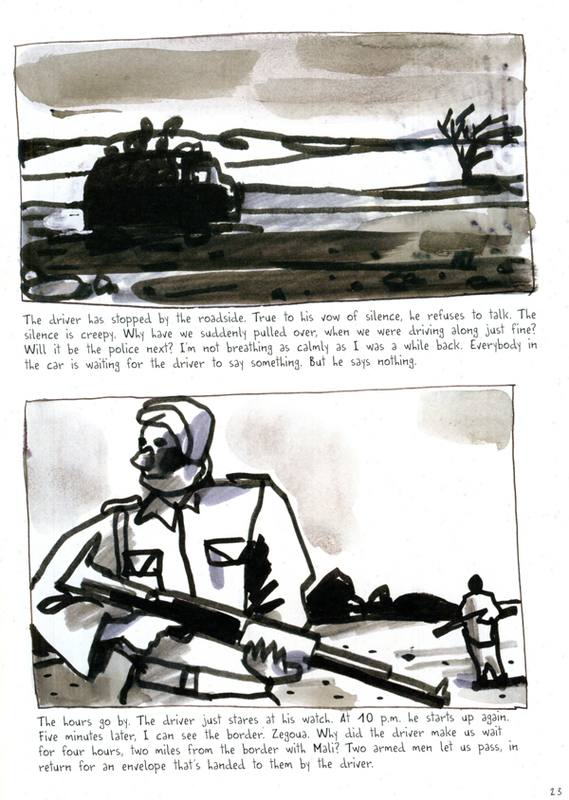 And, I believe, the initial collection of Prum watercolors gave way, somewhere in the process (through the translating and transcribing of his oral testimony) to having this all adhere more to a graphic novel/memoir framework. And, as you progress from page to page, alternating between artwork and text, you can’t help but totally empathize with Prum, from his stumbling into danger to his dogged perseverance. So, yes, ultimately it does feel and read like a work of comics. Prum begins his journey as a newlywed with a child on the way living in a tiny poverty-stricken village in Cambodia. Without any prospects, no education, no employment opportunities to speak of, Prum is one very desperate and vulnerable young man. Like so many others like him in similar situations, Prum is lured into a too-good-to-be-true offer of a good job with good money. 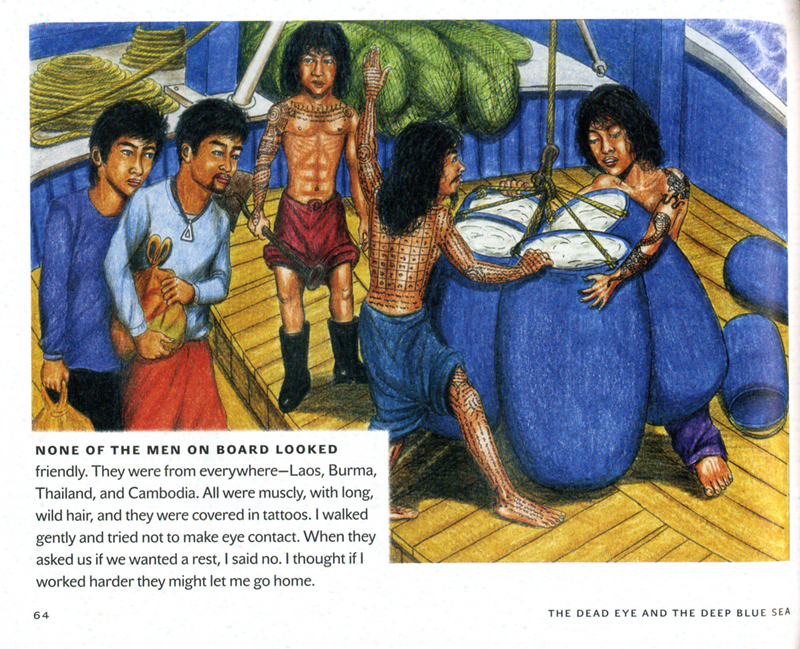 It is just a matter of one footstep into a truck, and overwhelming desperation, that leads Prum and a band of other victims onto a fishing vessel–followed by years of toil and torture, at the mercy of his overseers. “I want everyone to know about this. Through my pictures, I want to warn all cross-border migrant workers to be careful. 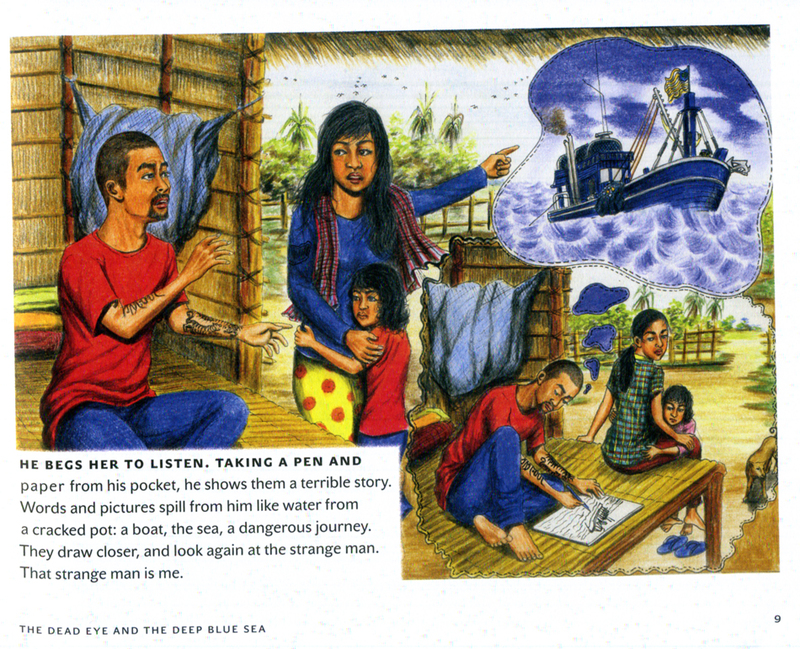 Even if they do not keep my own story in mind, they will at least have an idea of what life is like for people trafficked onto boats for forced labor.” Vannak Anan Prum is an artist who was held captive as a slave for four years on a Thai fishing boat before being sold into slavery on a Malaysian plantation for another year. He has since escaped and now lives with his family in Cambodia. Read his story here: http://tiny.cc/deadeye Vannak’s store is run by a handful of English speaking friends. 100% of the royalties earned from this store go directly to Vannak. Feel free to email us if you have any questions or would like to commission a work directly from Vannak. It is to the credit of Prum’s own natural artistic and poetic inclinations that his story never turns maudlin. It is also to Prum’s credit that, despite the grim circumstances, his narrative never grows too dark, as if the reader can rely upon Prum to find a way, to rise above, while also not suggesting he was some sort of hero. What Prum turned out to be is an authentic artist/journalist. While I’ve stressed that Prum’s main goal is accuracy, there is no denying that he also managed to remain faithful to artistry. He has a keen sense for pacing, composition, and for color. Life is back to the normal for him now, back with his wife and little daughter. While he continues to heal from his past, Prum can take solace that his voice has been heard and that his contributions are greatly appreciated. No doubt, this book will have readers wondering about where their last seafood meal came from. As I say, this is a tough subject to deal with, but it is essential that we educate ourselves on human trafficking and this book is invaluable in that process. Personally, I am very inspired by Prum’s story, made up of so many nuanced moments. I wondered, as I read, how he would make a life for himself after having been forced into slavery. What will freedom look like for him? I think this book will make a difference, not only to educate others but, hopefully, to help Prum and his family rise up to where they belong. I can see him developing further as a fine artist. 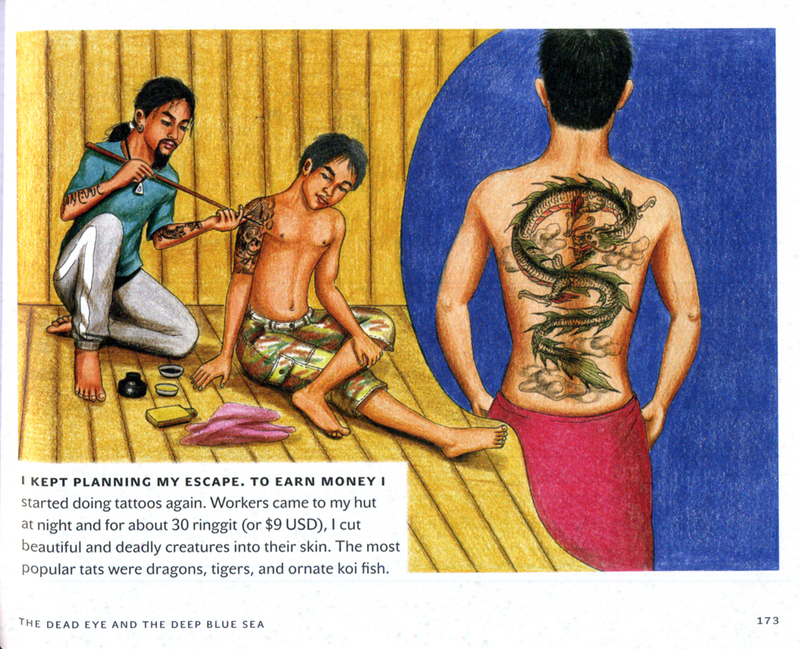 And, as the book demonstrates, I can also see him doing quite well as a renowned tattoo artist. I look forward to whatever he does next. Prum’s artwork saves his family. The Dead Eye and the Deep Blue Sea is a 256-page hardcover, in full color, published by Seven Stories Press. To learn more about Vannak Anan Prum, and purchase his art, visit him here.